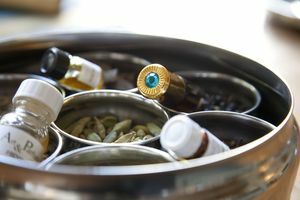 A couple of months ago at the Elements Showcase, I had a chance to sit down with Neela Vermeire of Neela Vermeire Créations to ask her a few questions about her trio of fragrances inspired by India. A native of Calcutta, Neela currently lives in Paris, where she launched a line of three fragrances: Trayee, Mohur and Bombay Bling. 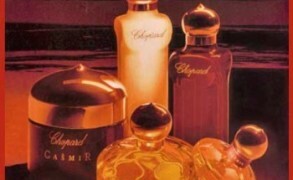 The perfumes were developed by Bertrand Duchaufour, who was moved by Indian scents and Neela’s stories. 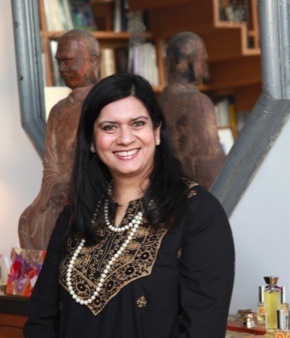 I thought that it would be interesting to share with you what motivated her to plunge into fragrance development, what it was like to work with Duchaufour and how her memories of India shaped the perfumes. What motivated you to start your own fragrance line? I have always been passionate about perfumes and wanted to create a few based on my past. It was more organic than simply wanting to start my own line. There was a part of me that wanted to pay homage to the country of my birthplace, India. Having very close ties to it yet living so far away, I wanted to revisit parts of my life whilst I lived there with my family and all my travels back. I wished to pay tribute and also, in a way, to reconnect with the India I had left behind. This had to be done with a highly skilled perfumer who appreciates nuances and gives the best effect without excess—sumptuous, but never smothering, since some natural raw materials can be quite heavy and rich. I researched three broad periods for the first trio. These will be the guidelines for the future, though there are so many other periods from which to draw inspiration as well. I developed my concept and delved into the periods – not just through history books but using all that is India for me: my olfactory experiences and memories from my childhood to the present times. In a way I wanted to create three perfumes for myself but also to share with others. These perfumes are meaningful to me because it is a personal journey. How did your collaboration with perfumer Bertrand Duchaufour come about? A friend, who owns a niche brand, introduced me to Bertrand. Bertrand really liked the concept very much and wanted to do all three, though I had initially intended to use three perfumers. Bertrand is a genuine and down to earth person, open to new cultures and was keen on hearing about the concept. As we spoke I realized from his description of his visits to India that he had interesting yet different set of experiences during his travels compared to what I had from growing up in India. This made the project very exciting. How did you explain to him what you had in mind? What was your brief, in other words? I explained my concept by going into the details of all the main events that are part of the idea, and also the natural raw materials used during these eras. I went through a list of my “India” with him which included wet earth, smell of freshly grilled roti (flatbread) from a roadside seller, henna, vetiver, sandalwood, rose attar, and mango. There were at least 40 other things. I even made Bertrand smell a few things I had with me. I had a book from India from 1950s, a shower gel made with Ayurvedic herbs and sandalwood sticks. It was mainly through many conversations that our fragrance ideas took their olfactory form. Also, while we were developing Trayee, Bertrand did his own research into Ayurveda. What was the most exciting point in the process of fragrance creation? The most frustrating? The whole process was fascinating because it is a project that is close to my heart. Bertrand was very respectful of all and any changes during the development process. He wanted to make sure that it was what I wanted. The only frustrating times were when I was confused about the opening notes and the dry down of Trayee, which represented my spiritual connection with India. It is something very close to my heart, yet we wanted to make sure that all the facets were clear. Mohur and Bombay Bling took shape faster and actually Bombay Bling was the easiest to create, even though it all took the same length of time. Bertrand got the joyful vibrant aspect quickly and executed it like the master perfumer he is. What was the most surprising thing that you learned in the process of fragrance creation? What elements of Trayee, Mohur and Bombay Bling make them distinctive and unique? These perfumes are very complex and rich in terms of raw materials and the experiences you feel or hopefully enjoy when you wear them. When working on my line, I hoped that each perfume would touch the wearer on an emotional level. 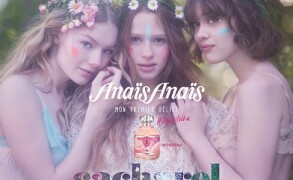 I love that the fragrances are not linear. Bombay Bling with its strong top fruity notes morphs into a floral and spicy composition. Trayee’s notes appear and reappear, keeping the wearer guessing and creating a memorable olfactory experience. Mohur gives a sense of comfort with its rich rose and oud combination. There is a soft accord wrapped into it with suede like notes that we used to evoke memories of the British Raj Era. Although—or perhaps because–it was a challenge to create, Trayee is one of the most evocative fragrances for me. It is a rich woody composition, with sandalwood, oud, vetiver and incense lending it many facets. On me, it changes all the time. This perfume was really inspired by various ceremonies I remember when growing up in India, and it touches me on such a deep level that I feel emotional speaking about it. What are some of the most interesting responses you’ve received on your fragrances? 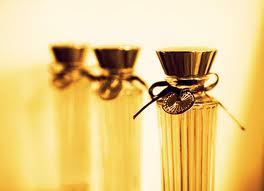 Many people who love perfumes love the fact that these perfumes are powerful without being brash in any way. I’ve gotten so many messages since people started trying the line, and the feedback has been great. One of the most touching comments was a message from a lady who was recovering from a difficult illness. She shared that Mohur was the scent that helped her and was her comfort scent to sleep and none of the India trio perfumes made her feel ill during her chemo. The moment she would spray Mohur and inhale its lush rose note, it would make her feel better. As a creator, I cannot imagine a more wonderful compliment on my fragrance. When you think of your most vivid fragrant recollections of India, what comes to mind? Always the ingredients used in the perfumes like sandalwood, incense, flowers, and spices. Then the smell of sea breeze, mountain air in the Himalayas, tea gardens in the north and the south, the damp smells of monsoon days, wet earth, spice markets, flower markets, fresh tropical fruits, roadside food stalls and the soothing fragrance of fresh coconut water straight from a coconut on a scorching summer day. What perfumes, besides your own, elicit a strong emotional response in you? Guerlain classics such as Après l’Ondée, Vol de Nuit, Jicky, L’Heure Bleue, especially pre-reformulated versions. I also enjoy some of Serge Lutens’s and Frederic Malle’s creations. These days I also continue to wear a lot of Chanel Bois des Iles and No 22. You currently live in Paris. What are some of the places that a perfume lover should not miss in Paris? I think it totally depends on what you cannot find in your home town or city, but for a one-stop shop, I highly recommend Printemps. Their newly renovated scent room is beautiful! I would go to Serge Lutens in Palais Royal, because I love the boutique and also to enjoy the atmosphere of Palais Royal. Maison Guerlain on the Champs Elysees and Frederic Malle boutiques are also worth a visit. The new location of Jovoy Paris is a special niche boutique where my perfumes are sold. Colette is another place to visit for trendier brands and spot some celebrities. 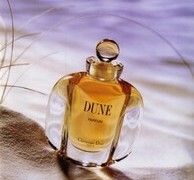 I also recommend JAR Parfums and the Costes store for IUNX perfumes. Le Marais has some beautiful little fragrance boutiques like Sens Unique and Marie Antoinette that sell niche perfumes. Neela Vermeire fragrances are available online from Luckyscent and Neela Vermeire Créations (other points of sale can be found through the website). Suzanna: These sound wonderful, all three. I am fascinated by how her impressions of growing up in India and what she wanted to describe in olfactory language was so different to what Bertrand Duchaufour had experienced and brought as his own conceptions. Victoria: Consumers can tell a difference, especially niche consumers. Lavanya: I have been dying to smell these! Mohur and Trayee sound like my kind of perfumes but I am very curious about the green mango note in Bombay Bling as the smell and taste of green mangoes (and ripe mangoes for that matter) is very tightly linked to my memories of India (and I love them) . Especially since I haven’t really been able to visit during the mango season..Do you actually smell the green mango in the perfume?. Vanessa: I enjoyed reading this interview very much for the insights it gave into the inspiration and whole creative process behind this trio of scents. I do so agree that they change a lot – Trayee and Bombay Bling certainly, Mohur not so much as far as I could detect. The discovery set idea is a neat one, with which I am vaguely toying, but the FB price is a bit prohibitive. It is a shame really, as Neela Vermeire has had *massive* coverage on the perfume blogs such that in theory she could shift a ton of sales of her range, but the price may prove a stumbling block. The opening of Bombay Bling perplexed me somewhat – I was minded to call it “aggravated fruit” at the risk of sounding disrespectful. I loved the drydown in particular, which was like a whole other perfume! (Nothing like two-for-one value – actually, that could be a sales argument to justify the high price point, as well as the quality ingredients!) And I could say the same about Trayee, the top notes of which were a bit full on spice cupboard for me, but again the drydown was stunning. Mohur was my favourite too for all the reasons people have mentioned. It didn’t surprise me so much with unexpected twists and turns, but that is appropriate maybe in a “nurturing” scent. Victoria: I smell more of a rhubarb note–tart, acidic, bracing. However, there is a piney mango-like facet as well. It is a fun fragrance. cryptic: That’s a scary percentage, and I’m glad that I purcased directly from Neela’s website instead of Lucky Scent, even though their free samples make buying from them so tempting.